Different graphics for corner and non-corner buildings was new to me. It sounds good idea and should require too much work, but I think i will make next another terraced house. First one retires 1895 (should it be lower?) and after that there is big gap between low density housing and my tenement. As for what you do next, do what you feel like. We need so many buildings of all sizes, eras and types, it doesn't matter if you focus on one rather than another at this stage. At some point (once planes and ships are all finished) I will start to think more seriously about citybuildings and what we need, but that won't affect things too much at this stage. We do have timber-structured old buildings over here, but the original ones tend to be less block-like than that picture. There was also a phase in the 1930s where half-timber modern construction houses was fashionable. Time to release this building. Will make something new tomorrow hopefully. If someone has photo of some 1890 - 1940 med density residential building I would be interested. Excellent! The snow on the roof of the latest building is a little too grey for my liking though - any chance it can be whiter? I normally add two layers of "clouds" texture in two shades of pale grey in blender and that does the trick. Maybe something similar would work for you. File updated with whiter snow on roof and without special colors. Any chance of window frames or am I being too picky? Preview of next building early stone shop. I think it would be good idea to make similar looking terraced house for early ages and make 3 story brick one later. Kieron: It has brick window frames. I generally think it's a very good idea to make similar looking buildings in "families". Helps for consitency. Can we have this shop in corner and non-corner versions as well? "Families" of buildings, yes... actually the "corner" and "non-corner" versions of a particular building are more "siblings" to each other, as opposed to the four rotations of each which are the "same" ... Archon, your lovely new stone corner shop, could have its non-corner version be a matching stone row-house, for example. Thus the corner shop never appears mid-block, and the row-house never appears on a corner. Good work on the tower blocks and snow images wlindley. I think we are just missing snow images for the earlier tower blocks and warehouses now, and then the industry-chain shops/pubs. about the corner versions - it would be best to have a non-corner shop and a corner shop rather than a non-corner house and corner shop, so as to make sure that both corner and non-corner versions are either both residential or both commercial. But never mind about that, as long as new graphics of this quality keep coming in, I'm not going to complain too loud! I will release all my buildings in one pak after I get houses for these ready and inn rendered with correct lighting. Those are simply awesome - your best yet! Constructive criticism - the verge detail on the gable ends needs some shadow - there would be an overhang, it looks a bit 'flat' at the moment. Same on the eaves where the gutter would be. Just an extra row of darker pixels would improve it immensely. There isn't really such a thing. Everybody was building low density suburbs after Ebenezer Howard's 1890s book advocating 'garden cities', and trying to move out of the existing high-med density accomodation, which was all pre-existing from the victorian period. The move out was income dependent, with the poorest staying in urban areas longest, and consequentially suffering most in the Blitz in 1941. High Density Urban a la modernists came post WW2 in the reconstruction - you could set the start date earlier for concrete 50s buildings (but post 1923 - Vers Une Architecture was published then), if you hypothesise WW2 not having happened, but then again it's more likely suburban sprawl would have just persisted unchecked! Archon: Gorgeous! But yes seems slightly "blurry" ... a few sharp edges would solve that, methinks. Given they don't add anything to gameplay, I don't really think they are a priority, but of course anyone is welcome to have a go. HQs should probably be 2x2. I wonder, could the HQ building be a much bigger building? Because, then, we could make it as the "locomotive works", like the GWR at Swindon / LSWR at Eastleigh, etc - then it would have a purpose. Maybe it could be a 3x6 building or something suitably large? With a turntable and suchlike. If someone is clever with code, perhaps it could confer a 'loyalty bonus' on the company with respect to inhabitants of the town it's located in? Or function as a passenger-or-material-demanding industry in its own right? Could it demand Steel say? I suppose the trick is to make it not railway-specific... maybe big office building is best after all? Just thinking creatively... don't mind me! It took longer than expected but now they are ready. Packed all my buildings in one file. Any chance of the source files? Headquarter produce passengers. And they can be larger than 1x1. Pak64 has 2x2 headquarters. Still to come, final 1870 offices with snow. Sources are in that file (it is actually .pak.zip). Thanks - I had to rename as .zip and it was OK. Thanks for the clarification. Even so, less of a priority than citybuilding variety / planes / ships for now. 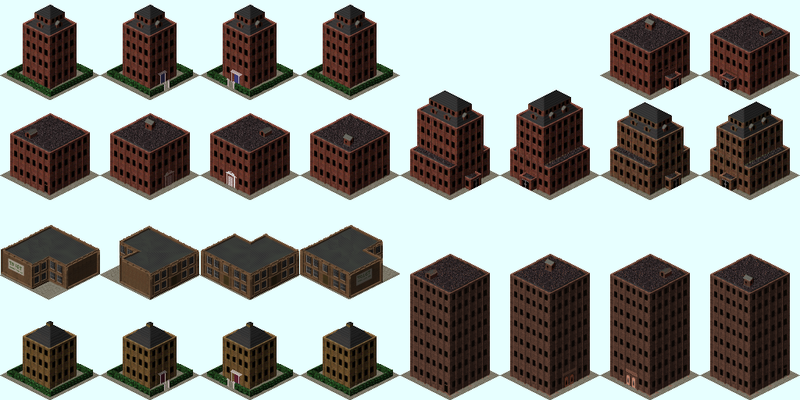 If anyone does want a go, I think 2x2 office type structures are the way forward, several different levels of design. Unfortunately AP's suggestion doesn't reflect the way the game deals with it. AP's suggestion doesn't reflect the way the game deals with it. As far as the game is concerned, the headquarters is just eye-candy, and produces a few passengers, right? So why not break with the (boring) tradition of other paks and have something fun like a big railway works? Or do I miss something here. edit: This hat-Issue we had gave me the idea of having a building with a hat anyway. Ok it's not so suitable in this set here, i admit. The headquarters are more of a status symbol than mere eye-candy: they are expensive to buy and maintain and have little function in themselves, so only the most successful companies can afford them. 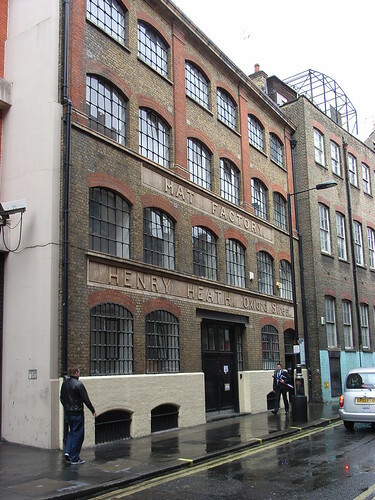 mobo: how about the Henry Heath Hat Factory from London's West End? Could it be a proper Factory, accepting Wool producing Textiles, like a small-scale city-based Textile Mill? Probably best as a city industrial building (of which we need more anyway). Excellent idea, though! @wlindley - thanks for the snow images. We still need the 1950s parking lot (currently the only citybuilding without snow) and at some stage (not necessarily for this release) the industry-chain shops you did. TheHood: OK, I'm on it. no fair peeking at the filename. Parking lot .pak and sources with snow images, and both 1950 and 1980 eras. Small point - would it be better with white on blue for "P" sign?